The X Brace is an elastic foot brace that treats foot pain. 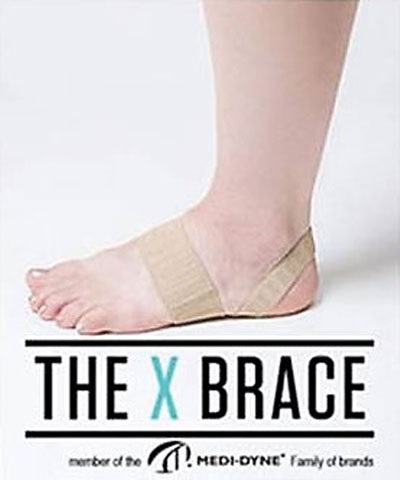 The X Brace’s patented “X” design eases some of the tension and stress placed on the plantar fascia ligament by limiting the amount of stretching it can do, therefore keeping it from stretching excessively and causing significant pain. Its ease of use, simplistic design and its ability to address a very complex issue of foot pain due to Plantar Fasciitis, Sever’s Disease, and Over-pronation are often caused by under-supported, over-use of the foot. It provides support and reduces arch pressure very similar to how low-dye taping works but without all the expertise, time and tape necessary. 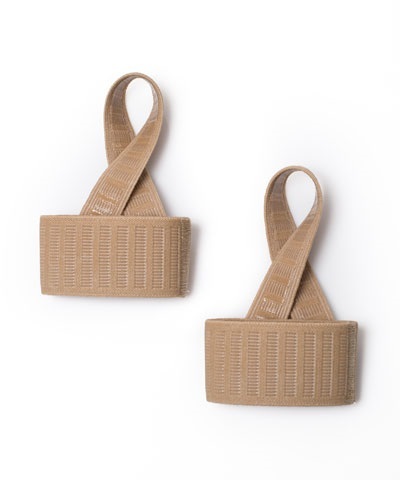 This support of the arch also helps offset over-pronation, effectively addressing what can be debilitating foot pain. The low profile design makes it comfortable to wear with any style of footwear or barefoot. To find the best support, measure the circumference of your arch right below ball of foot and follow chart measurements below. If your arch measurement is different from your shoe size select the appropriate size for your arch measurement. Arch measurement shown is by inches.